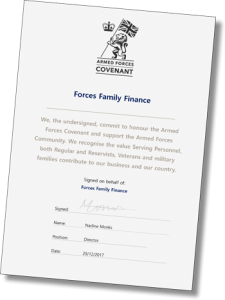 Forces Family Finance is proud to be a signatory to the Armed Forces Covenant – a promise from the nation that those who serve or have served, and their families, are treated fairly. We commit to honour the Armed Forces Covenant and support the Armed Forces Community. We recognise the value Serving Personnel, both Regular and Reservists, Veterans and military families contribute to our business and our country. You can read more about the Armed Forces Covenant here. 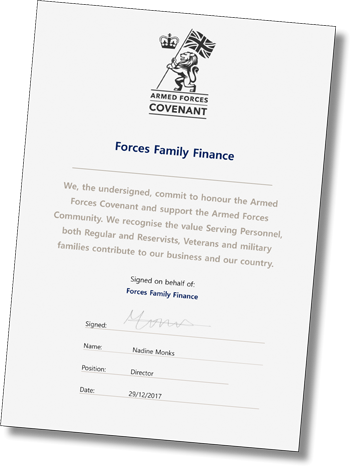 promoting the fact that we are an armed forces-friendly organisation; via our branding, military specific information and by displaying the corporate covenant logo and pledge on our website. seeking to support the employment of service spouses/partners and veterans by offering full training and careers with in the company that offer flexibility and are fully mobile. working with the Career Transition Partnership (CTP), in order to establish a tailored employment pathway for Service Leavers; This will be done with the support of our principle New Leaf distribution who are ELCAS approved providers of financial services training. aiming to actively participate in Armed Forces Day and actively promoting this event via our marketing mediums. Working with other financial institutions and organisations to create an awareness of service family’s needs for flexibility when credit scoring due to high mobility and the adverse effect this can have. Continue to champion a fairer approach to the way financial services applications are assessed and insurances products are underwritten and priced for Armed Forces members. Provide members of the military community a whole of market offering with a full advice and recommendation service. Continue to develop and adapt our product range and services to cover various military specific situations. Where possible advisors are to work within local garrisons to increase and encourage financial education amongst the military community free of charge.